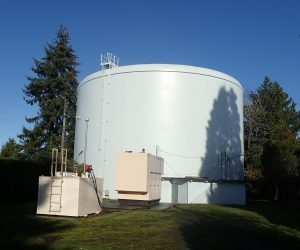 Long Painting was the prime contractor working with CB&I and Sundancer Electric to perform minor improvements and coatings refurbishment to the Olympic View Reservoir located in Edmonds. Long performed spot repairs to the interior coatings then disinfected the inside of the tank. The crew managed the exterior modifications while performing spot repairs of the existing exterior coatings followed by a full midcoat and topcoat to new and existing surfaces on the reservoir and the adjacent pump house.